I got stung by one of my bees last Saturday. Ouch. It really hurt. It made me hurry to finish the hive inspection. My ankle hurt quite bad for a day, then itched really bad for two days. It didn't really swell much. I hope I don't develop an allergy. I've had a bunch of bee stings before, so I don't think I will. From now on, I'll wear my plastic boots to protect my ankles. I don't think I'm ever going to be one of those cool bee keepers who goes bear handed and without protection. I did know that my bees were annoyed with me before the sting. My smoke kept running out and it was taking me a very long time to inspect the whole hive. It seems there's a balance for inspections between moving slow and getting the job over with. Especially with a jam packed hive of bees. It rained all day yesterday. My garden gauge registered just over an inch. 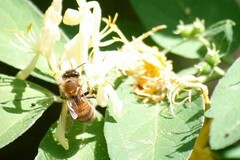 I suppose the bees hung out in their crowded hives all day as well as the nights. And today, it was sort of cloudy and still seemed damp. 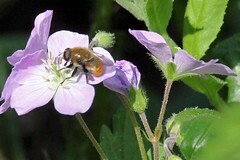 I've read that a sunny day after rain is when bees will swarm, so I was watching as I worked in the garden. But they are still all at home. No swarms. My sister is visiting and she asked me how can you stop bees from out growing a hive? I don't know. I told her that I don't think you can. If you're lucky and the bees are healthy, they grow. A couple weeks ago, I was very worried because I thought my bees were about to swarm and had foul brood. 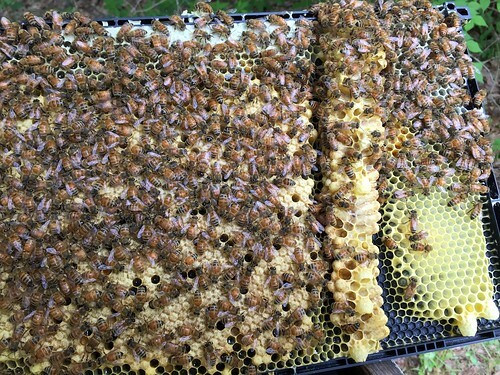 After lots of advice, it turns out I had seen a row of drone cells and a few uncapped queen cups. 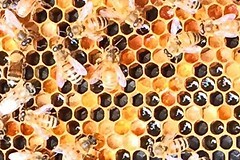 I had also noticed that the bees were beginning to store food in old brood frames, which surprised me and I thought there was something wrong like foul brood or other nasty disease. 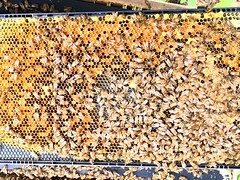 My beekeeper friends probably got tired of reassuring me that my hives were OK. And, as one pointed out, foul brood and swarming are two complete opposites: An overly healthy hive and a sick one. I didn't inspect the lower brood box because I worried I wouldn't have been able to pick the top one up off the ground and get it back into place (I'll get a bench). And I'll buy an extra brood box in case I want to split a hive or catch a swarm. 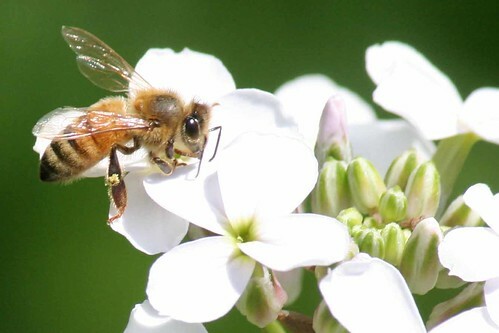 where do my bees go? 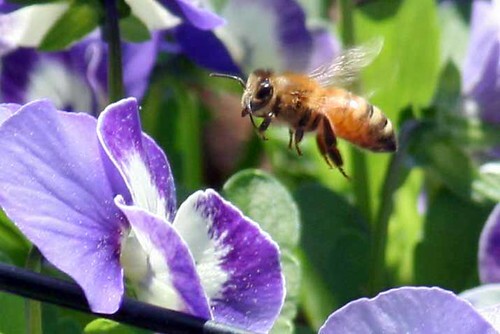 I've been watching which flowers my bees are on. In May, I saw them on wild phlox, violas, crab apples and Carolina silverbell. In June, black locust, beauty bush, Nepeta, wild rose and clover. I'm finding I'm spending a lot of time on my bees and the topic doesn't really fit with my vegetable garden blog. So I'm trying something new. A separate blog for the bees. I'll put a link in skippy's vegetable garden blog when I post here. I'm calling it Kathy's bees because neither Skippy nor Suzie go near the hives - only me. 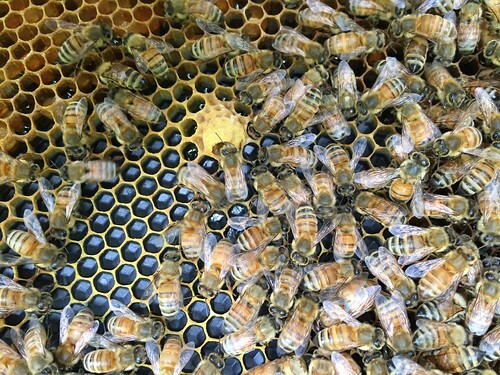 I'm trying to figure out the best way to keep a record of my bees. First, I had Siri transcribe my observations, then just transferred that to a word document. But Siri doesn't understand me very well and see certainly doesn't know words like "brood box". So now I have an excel table with lots of information. I jot down notes as I inspect the hives, then transfer it to the table later. I suppose this is OK, but I'm still working out what information I really need to record. I've tried using some online record keeping resources, but they were too complicated for me to get started with (e.g. Hive Tracker). Maybe they're for advanced beekeepers. I'm going the try BeeTight when I have time. are they getting ready to swarm?